TSKgel SWXL columns, introduced in 1987, have become synonymous with analyzing protein molar masses in the field of biotechnology. TSKgel SWXL columns contain smaller particles than TSKgel SW columns; 5 and 8 μm versus 10 and 13 μm. As the TSKgel SW columns, TSKgel SWXL columns feature highly porous silica particles, the surface of which has been shielded from interacting with proteins by derivatization with ligands containing diol functional groups. TSKgel SWXL columns stand out from other silica- or polymer-based high performance size exclusion columns by virtue of their large pore volumes. These columns are commonly used in the quality control of monoclonal antibodies and other biopharmaceutical products. 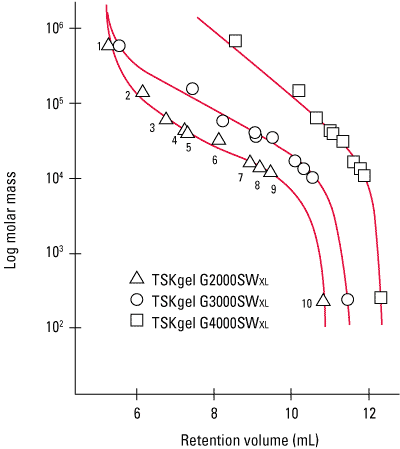 The figure shows the calibration curves for globular proteins, polyethylene oxides and dextrans for each of the three TSKgel SWXL columns. Tables within the tabs below summarize the molar mass ranges for the TSKgel G2000SWXL, G3000SWXL and G4000SWXL columns for globular proteins, polyethylene oxides and dextrans that can, at least partially, access the pores.